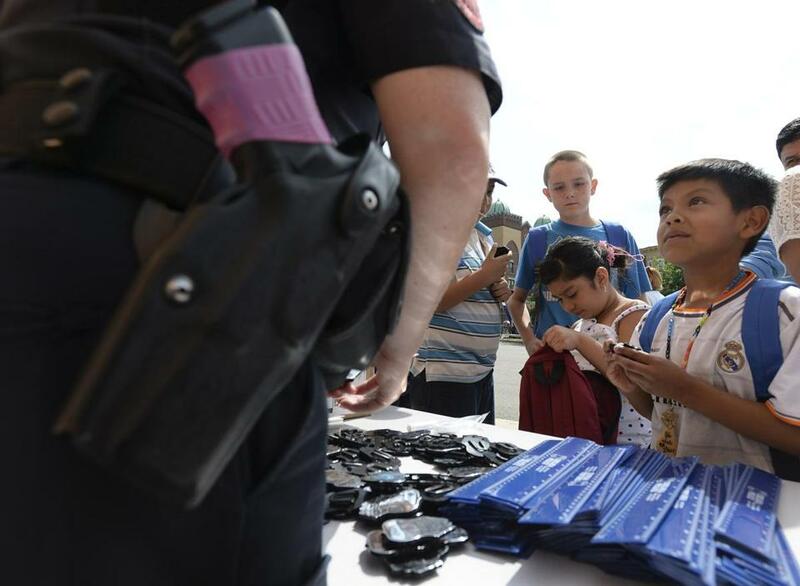 Jose Ramirez, 6, of Chelsea looked up at a police officer at the back-to-school celebration at Williams School. The state’s eight most ethnically and racially diverse communities are still policed by a predominantly white corps of officers, despite years of efforts to dispel perceptions of racism and diversify their ranks. But against the backdrop of unrest in Ferguson, Mo., many local law enforcement officials say they have worked to forge relationships with community groups that would quell the type of outrage that exploded in Ferguson following the Aug. 9 fatal shooting of an unarmed black teenager by a white officer. “You’ve got to have those partnerships, so that if something does happen, you can reach out to either side,” said Kevin Coppinger, the police chief in Lynn, whose department has sought to make inroads in a Latino community that makes up 31 percent of the city’s population. “You’ve got to have a dialogue,” Coppinger said. In Ferguson, much has been made of the racial divide between the police department and the community: While nearly 70 percent of Ferguson’s residents are black, more than 94 percent of the department is white. Disparities in Massachusetts are not as stark. But local officials acknowledge that they have struggled for years to diversify police department ranks, a challenge they attribute to failed recruitment efforts and obstructive state Civil Service rules that govern hiring. “Ferguson brought this to the forefront, but we’ve always been having this conversation,” said Mayor Daniel Rivera of Lawrence, acknowledging a disparity in his city of 76,331, where white residents make up only about 20 percent of the population, but account for nearly 77 percent of the police force. He sent a letter to the state Human Resources Division earlier this year highlighting concerns with decades-old rules that govern the department’s hiring process. The Globe examined eight Massachusetts communities where a majority of the population is neither white nor Hispanic. Some departments have grappled with accusations of racial profiling, an issue compounded by lack of diversity. The town of Randolph, for example, was forced by the US Department of Justice a decade ago to provide cultural training for officers and build better community partnerships after two high-profile allegations of racial profiling: In one case, a black off-duty Boston police officer said he was harassed and mistaken for a shooting suspect as he was leaving a sandwich shop. In another case, officers allegedly used racial slurs and roughhoused young black men during an altercation at a fast-food restaurant. The population of black residents in Randolph, a town of 32,383, nearly doubled between 2000 and 2010, according to Census figures, but the police force remains 81 percent white. The town is 38.4 percent white. Randolph Police Chief William Pace said the town has tried to hire people of color into the department, but the number of open positions has been outpaced by the town’s rapidly changing demographics. “It’s just taking time to filter through,” Pace said. “The power structure is mostly white, and you have this tremendously diverse community. And [the police department] is not a reflection of the community itself,” Harris said. James Madden, who interviewed dozens of Randolph residents for his 2010 MIT thesis for a master’s degree on city planning, said that people of color reported avoiding Route 28 heading into Randolph because they feared being stopped by town police. That practice has stopped, he said, but the memory lingers. Elisa Fontes, who is from Cape Verde, listened to restaurant owner Jose Cruz at his Sunset Cafe in Brockton. Of the state’s most diverse municipalities, Boston’s police department is by far the most representative of its city’s demographics, though the department has struggled to diversify its upper ranks. Black residents make up just over a quarter of the city’s population and make up 23.2 percent of the police force. Asians and Latinos are slightly underrepresented. The city last year named William G. Gross as the superintendent in chief, the department’s first black second-in-command. While other communities simply advertise a desire for more officers of color, Boston has sent officers into neighborhoods such as Roxbury, Mattapan, and Dorchester to identify and mentor promising candidates for the department, said Jack McDevitt, who runs the Institute on Race and Justice at Northeastern University, and tracked Boston’s efforts. And, McDevitt added, Boston is in the midst of a $2 million overhaul of its promotional exams, specifically to eliminate performance gaps between white and minority officers seeking to enter the department’s higher ranks. Phillip Goff, cofounder and president of the Center for Policing Equity at the University of California Los Angeles, said that while it is important for police departments to better reflect their communities, particularly in their upper ranks, it is equally important that the department creates positive relationships with the community. When Chelsea Police Chief Brian Kyes joined the police force in 1987, he said, there was just one Spanish-speaking officer and one black officer. There are now 27 Latino officers on the 103-member force. In Lawrence, Rivera, the mayor, said he attended high school with many of the city’s police officers, and many of them have sought to cross the cultural gap with the community by learning Spanish, and interacting with community groups. From Chelsea to Lawrence, police departments have worked to sharpen what Goff calls the “art to community policing.” That means calming communities after violent incidents, but it can also be as mundane as explaining the need for local ordinances, like those regulating noise limits, or restricting double parking. In Holyoke, where white residents account for 48 percent of the population but 77 percent of the police force, Chief James M. Neiswanger has officers walking neighborhoods, and this year officers began participating in cultural awareness training. In Brockton, the department has appointed Elisa Fontes, who is Cape Verdean, as the department’s community resource officer. The department has also created partnerships with youth leadership groups. One of the teenage founders of the Brockton Youth Council is now an intern with the department, helping to create new youth programs and, as he put it, new community relationships. “There’s youth that tell me, why do I work for the police department? Why do I work with the police department?” said Anthony Fowler, 18, who describes himself as multiracial, and is studying to become a police officer. 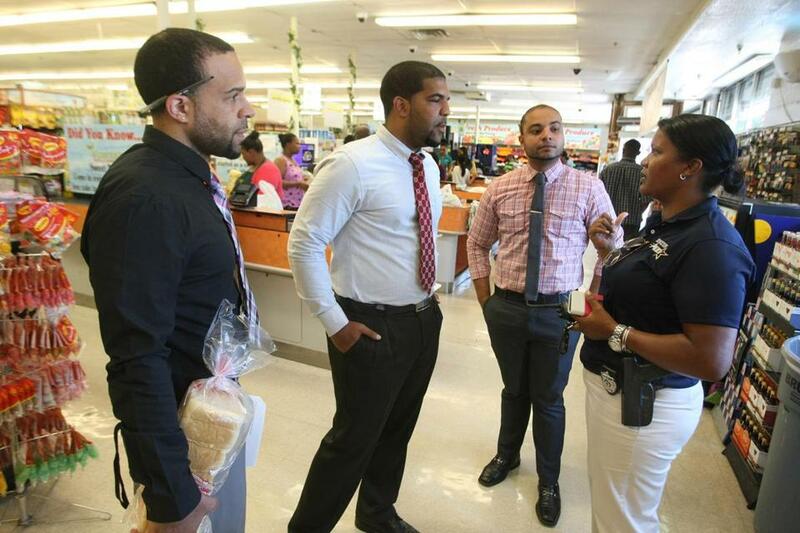 Elisa Fontes talked with store managers Brian Vicente, Jason Barbosa, and Tony Vicente at Vicente’s Tropical Supermarket in Brockton. Fontes describes an ongoing effort to engage minority communities in Brockton, where 40 percent of the population — but only 13 percent of the police force — is black. She recently provided a reporter a tour of the city, stopping by Cape Verdean restaurants, the city’s tropical grocery store, and a park where the homeless congregate. She called out greetings in English and Cape Verdean Creole to residents she knows by name. One of them, on perhaps Fontes’s most important stop of the day, was Larina Depina, a 14-year-old Cape Verdean girl who told Fontes she wants to become a police officer. They sat in Depina’s front yard to talk about her education, the need to respect her parents, ways to avoid peer pressure, and the possibility of joining a Teen Police Academy. “It seems very easy to do all that,” Depina told Fontes, smiling. Depina told Fontes that her love for the police originated with the crime shows she watches with her little sister. Fontes was the first real police officer she had ever spoken with, she said, other than the police who showed up at her door when she was about 6 years old and accidentally called 911. Depina was shy during their conversation, but did not stop smiling. As she left, Fontes said the girl reminded her of herself. Other law enforcement officials pointed out the need to simply have conversations with community groups, to build cultural understanding. Coppinger, the Lynn chief, said he has reached out to leaders in the Guatemalan community in his city, to find out why immigrants would not report crimes. He learned of their distrust of police in their home country. The chief says he himself gained a better cultural understanding of Asian communities after simply speaking to fellow officers in the 1980s, who explained to Coppinger why new immigrants were reluctant to turn their backs toward police. In their home countries, that would mean they were to be executed. While police officials said that starting the conversation is important, they emphasized that there is also a need for such conversations to be continuous. “We can’t be strangers to one another,” said Kyes, the Chelsea police chief. Todd Wallack of the Globe Staff contributed. Evan Allen can be reached at evan.allen@globe.com. Follow her on Twitter @evanmallen. Milton J. Valencia can be reached atmvalencia@globe.com. Follow him on Twitter @miltonvalencia.